Lebkuchen is another food closely associated with Christmas in Austria. Its main function is to mark the opening of the festive season – nothing announces the arrival of Christmas quite like great aisles of the stuff suddenly appearing in the supermarkets (usually while the Halloween candy is still being put away). It also occupies a place of honor on the plate of biscuits you bring out when guests come round in December. It’s a rich, dry, soft biscuit pastry that traditionally uses a lot of honey and is heavily spiced. The “Lebkuchen mix” in our kitchen cupboard consists of, for example, cinnamon, nutmeg, coriander, ginger, fennel, cloves, allspice, aniseed and cardamom. If you want to get a quick (and cheap) idea of the taste, pop into any supermarket for the mass-produced variety. 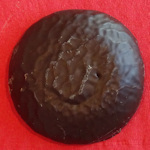 Alternatively, look out for the handmade and specialty Lebkuchen in family bakeries or on market stands. They come in all sorts of shapes and sizes, but the commonest is the raised, round form in the photos above. They can be plain, garnished with nuts or dried fruits, or (increasingly) smothered in a chocolate couverture. As you can imagine, there are various regional varieties throughout central Europe and a long, long, long tradition of Lebkuchen baking. We used to order boxes from a bakery in Aussee, for example, where production dates back to 1587. The association with the Christmas period is unclear, but is likely to do with Lebkuchen’s suitability for the traditional advent fasting period of times gone by. Long-lasting varieties are used to make the large Lebkuchen hearts you often find around Vienna’s Christmas markets, decorated with icing and bearing messages like “World’s best granny”. The pastry is much harder, so these hearts rank just behind cockroaches in terms of ability to survive a nuclear explosion. 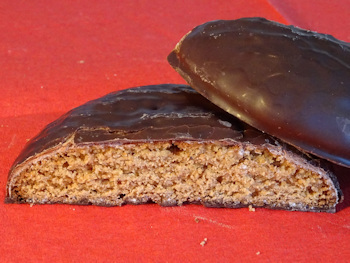 This Lebkuchen variety is also used to build the Austrian equivalent of gingerbread houses. 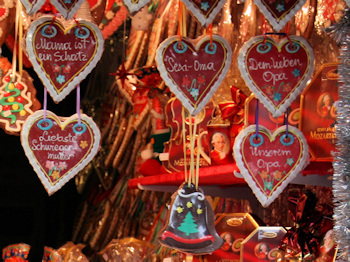 If you’re lucky, you might see one on display at a market: there’s a stand at the Christkindlmarkt that often has one.